Last week I did my first round of glaze tests on a ^6 translucent clay body. I used 4 different base glazes and added different stains to them. I still have a long way to go but I am happy with what I’ve discovered so far! For this set I used mishima to translate grid plans onto clay. In this process I found it difficult to stay true to each plan. Replicating precise line drawings on a round surface and a clay surface was a challenge. I wanted the mugs to look like there was a black and white line drawing on them and that is why I chose the mishima technique as opposed to the sgraffito technique. I made a Leach Clear glaze which happened to craze on the ^10 porcelain. In the smaller mugs, which I acquired from my classmate, you can see a spiral of gray and white on the surface, which is studio stoneware and porcelain marbled. The Leach Clear glaze seemed to better fit the stoneware. I think I made a poor glaze choice by applying Yellow Salt to the insides. Using a darker color on the interior would have created more contrast. 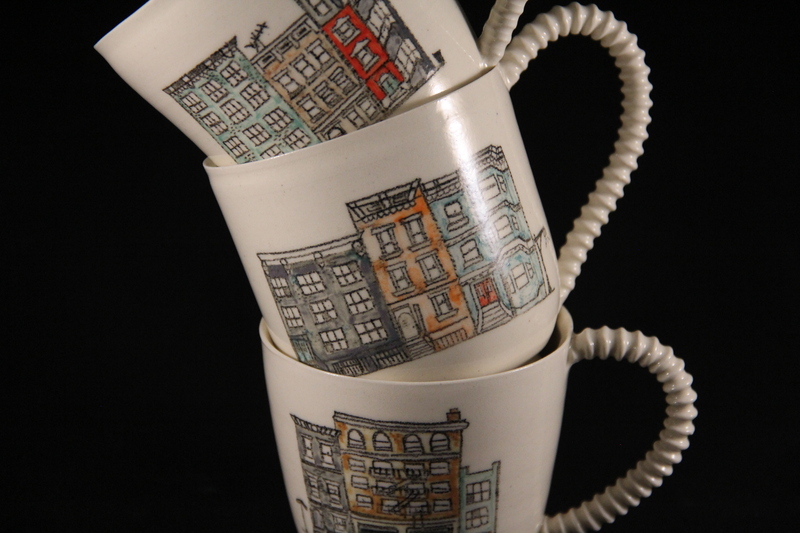 Perhaps next time I would use black underglaze on the inside. In wheel class we were asked to throw two sets of mugs. Before we attached any handles or made any major alterations/surface designs, we were instructed to exchange two mugs from each set with a classmate and find a way to incorporate these new forms into a cohesive set. We were encouraged to explore different surface techniques and I decided to try my hand at sgraffito. This set is inspired by window architecture. I used specific photo references for each design. I’m not too pleased with the cloudiness of the green celadon glaze, it’s amazing how glaze can either make or break a piece. I recently took a trip to the library in search of a book to satisfy my hunger to better understand New York City. That is when I found New York City Neighborhoods: The 18th Century, by Nan A. Rothschild. I was immediately attracted to these simple yet beautiful grid plans, which were sporadically found through out the book. Not only was I visually pleased with what I found in this book, but the text is also exceptionally informative and interesting. The book is about an archaeological study of the growth of Manhattan during the eighteenth century. It provides excellent insights into the development of urban structure and how they are defined spatially. Here are a few examples of grid plans found in this book.